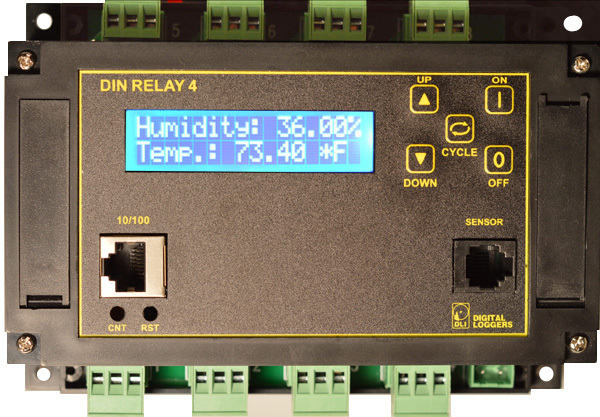 Control 8 relays in a compact DIN package from your web browser! - Ships Overnight - 15 Day Free Trial! Web power switching is now affordable! This smart relay includes a web server, power supply, auto-ping, clock/calendar, and eight relays all in a miniaturized package at a breakthrough price! Automate and control. Do it reliably. Save time. Eliminate service calls. Reboot remote routers and APs. Control and sequence lighting or machinery. All you need is a browser. It's ready to use, right out of the box. Need something totally custom? Add your own code with the built-in scripting language, or automate externally via the Rest API. Our newest model adds WiFi, analog inputs, Alexa compatibility, MQTT, SNMP, and a host of new features. Call (408) 330-5599, read the FAQs, check the updated spec sheet, or preview the manual. Need something similar? We also build AC power controllers and PoE injectors, and a DIY Arduino programmable relay.. External sensors and accessories are available separately.